RWBY: Grimm Eclipse is a Hack and Slash game based off Rooster Teeth's animated series RWBY. The game went into early access on December 1st, 2015 and the full game was released on July 5th, 2016. The game is available on Steam here . The game was also ported to the PlayStation 4 and Xbox One, and was released on their respective digital platforms on January 17th, 2017. 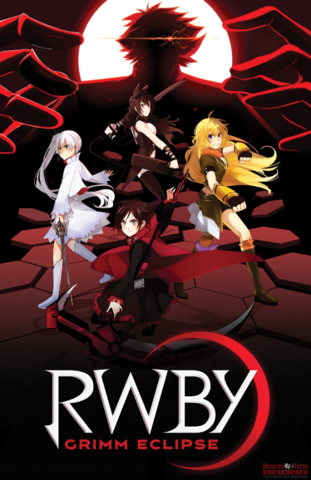 The game allows players to pick any of the four members of Team RWBY and fight against the creatures of Grimm cooperatively online. As players progress through the game, they level up and gain points that can be used to upgrade skills. Each character's moveset includes a Light ground and air combo, a chargeable Heavy attack, a Ranged combo ending with a special projectile, a Team Attack that can be used when a teammate stuns an enemy, and an Ultimate that can clear all enemies in an area. The game's story involve Team RWBY being asked to investigate why the security network went down in the Emerald Forest. The team manages to fix the network, but discover crates bearing the logo of the now-defunct Merlot Industries, which were seemingly used to transport Grimm. As the team investigates why these crates were here, they discover an evil plan involving the creation of super-powered mutant Grimm. In October 2016, the game got its first DLC pack which introduced a horde mode and also made Team JNPR playable characters. Further DLC packs have followed. Adaptational Badass: Jaune Arc is the least powerful main character in the series proper. Here, he's powerful enough to be listed as a Game-Breaker in the YMMV page. Ascended Fanfic: The game was originally a fangame, but Rooster Teeth made it into an official Licensed Game and added it into the canon of the story. Attack Its Weak Point: The mutant Death Stalker receives more damage when attacked on its stinger. Big Bad: Professor Merlot, a scientist obsessed with experimenting on Grimm. Boss Banter: A variant; during the end of Chapter 7 and most of Chapter 8, Dr. Merlot will exchange banter with Professor Ozpin while you battle the Grimm. Played straighter in Chapters 9 and 10, especially during the final boss battle, during which Merlot taunts you mercilessly until his Villainous Breakdown towards the end. Boss in Mook Clothing: Mutated Beowolves have enormous health pools, as well as very powerful and wide-reaching attacks. It can easily take as long to take down a single Mutated Beowolf as an entire wave of other Grimm, but they appear as Elite Mooks in later levels. Bragging Rights Reward: Hunter Ranks. They don't really change anything in the game proper and simply add a fancy badge next to the player's name (and reset all levels and unlocked abilities the player has gained). Apparently, they will eventually be used for unlockables down the line. As of now, they do nothing. Breaking the Fourth Wall: Naturally, Yang gets one of these moments during Forever Fall. Yang: Oh look, a cleverly disguised jumping puzzle. Canon Foreigner: Dr. Merlot and the mutant Grimm (although he is reportedly responsible for the collapse of Mountain Glenn). Early-Bird Cameo: Jaune's Semblance first appeared in this game, a year and a half before it first appeared in the series proper in Volume 5. Expy: Lampshaded by the chapter 7 title, Dr. Merlot is pretty much Dr. Moreau. Fake Longevity: Getting up the Hunter Rank 10 will require tons of playthroughs and grinding, many of the rank requirements being Mass Monster Slaughter Sidequest. For Science! : Appears to have been Dr. Merlot's primary motivation. His only concern was advancing the field of science (particularly genetics and artificial intelligence), with little or no regard as to how many lives would be lost in the process. When he and Ozpin argue about the fall of Mountain Glenn, which saw the loss of the entire town's inhabitants, Ozpin is utterly incredulous that the only thing Merlot mourns is the loss of his research. Game-Breaking Bug: The JNPR DLC and Horde update unfortunately causes a lot of game crashes within 5 minutes of gameplay. Players can fix it using a "Force DXD 9" command, but it reportedly does not work for everyone. Ghost City: Mountain Glenn, the Grimm-infested former seat of Merlot Industries' headquarters, is a level in the game. Kirk Summation: Ozpin tries to give one to Dr. Merlot at the end of Chapter 7 and throughout Chapter 8, but Merlot rebukes everything he says. Ozpin: You've missed the point. An entire city was laid to waste. Countless lives were lost. My only question is how much of the damage were you personally responsible for? Dr. Merlot: Well, how else was I meant to conduct my research? Our supply of test subjects was running thin. Made of Explodium: The mutant Creeps explode when they die... or just feel like exploding. Never My Fault: Dr. Merlot asks if Ozpin would believe him if he said the fall of Mountain Glenn wasn't his fault. However, the only thing Ozpin is willing to believe is that Merlot never takes responsibility for his actions. Offstage Villainy: Professor Merlot keeps taunting you through several screens in his laboratory, and sends robot guards and Grimm after you, but you never see him in person. Let's start this mission with a Yang! Well, water we waiting for?! Get it...? Guys...? Awwww who wants to share a sappy moment with me under the tree? Careful guys, you wouldn't want to trip and... Forever Fall... Eh? Amiright? Hey Oobleck! Tell Port we found a port! Scary Scorpions: The Mutant Deathstalker. Shout-Out: To The Legend of Zelda. Jaune: Armed with a sword and shield, I've never been more inclined to smash pots in search of a key. Where have I seen that before? Snake Oil Salesman: At the start of Chapter 9, Dr. Merlot acts like one, pitching his plans for Merlot Industries to Team RWBY. Suddenly SHOUTING! : Dr. Oobleck, naturally. Oobleck: It might mean nothing... OR IT MIGHT MEAN EVERYTHING! Taking You with Me: After you destroy all his test subjects and equipment, Dr. Merlot sets the laboratory to self-destruct in a final attempt to kill you. It doesn't work. The End... Or Is It? : Happens the first time you beat the game. After the credits roll, "THE END" appears on screen... followed by "...or is it?" as Merlot laughs at you. Timed Mission: The end of Chapter 4, in which you discover a mining cart with a large bomb strapped to it. You have six minutes to gather Dust crystals to power the cart, gradually sending it towards a large chasm into which it will eventually fall and explode safely, all the while being ravaged by hordes of Grimm. Thankfully the time limit is very generous, and there's even an achievement for finishing it with more than half the time still on the clock. Unique Enemy: Almost all varieties of Grimm are fought as standard enemies or Elite Mooks in later levels, even if they originally appeared on their own as a miniboss. However, there is a grand total of one Ursa Major in the game, at the end of Chapter 3. Villainous Breakdown: Professor Merlot undergoes a gradual one as you rampage through his laboratory. He loses it completely by the time you reach the final boss, and ends up practically begging it to just finish you off already. When it doesn't, he decides to blow up the lab in a final desperate attempt to kill you. Villain Song: Merlot gets one in the credits. The song would later be used twice during Volume 4 - once when Emerald and Mercury are watching Grimm spawn, and once when the Nuckelavee is about to attack Ruby and Jaune. Why Won't You Die? : Dr. Merlot during the final battles in both Chapters 9 and 10, although it's usually more along the lines of "Why Can't My Monsters Kill You?" Dr. Merlot: [audibly panicking] This is impossible! You should be getting eaten alive by now!